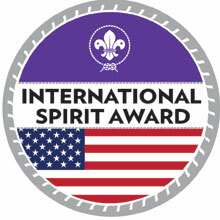 The International Spirit Award is for youth and adult leaders. The award seeks to broaden knowledge of international Scouting and increase appreciation and awareness of different cultures and countries. The emblem is worn as a temporary patch centered on the right uniform pocket. One of the requirements for this award for all levels, including Cub Scout, Boy Scout/Varsity/Venturer, as well as Scouter, is to participate in Jamboree on the Air or Jamboree on the Internet. You can find all the requirements and the application here. This is a great way to encourage participation in your Jamboree on the Air event.